These are the words that made Senator Bernie Sanders vote no on Russell Vought in his confirmation hearing for deputy director of the Office of Management and Budget. The offending words were from an article Vought wrote for a conservative outlet called the Resurgent. The context was a tenured professor at Wheaton College who wore a hijab in solidarity with Muslims during Ramadan. She remarked that Muslims and Christians pray to the same God. Vought defends Wheaton’s decision to fire her by appealing to Christianity’s well-attested doctrine of religious exclusivity. And, you know, the Bible. That’s Vought defending the biblical view of exclusivity. No other name. That phrase is odious to Senator Bernie Sanders. First he says it’s indefensible. I’m not sure if he means that Vought can’t defend it no matter how he spins it or if he thinks Christian exclusivity is itself devoid of any reason that can be defended. I suspect that it’s both. But to be clear Vought’s words from the original document show that Muslims are not condemned by Vought. They are condemned by Jesus. If Jesus is King of all the world, then there is no middle ground. This has been the position of the Christian church for thousands of years. 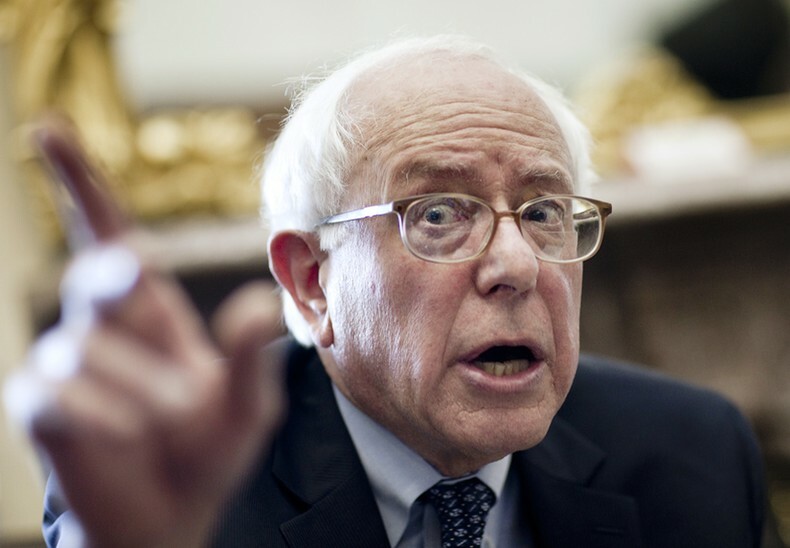 I’m not sure what Bubble Senator Sanders has been living in, well actually I think I do. It’s a bubble that assumes Christianity has progressed since, you know, the first century. Sanders is appalled that Christians like this still exist. Chris Van Hollen, another Senator, tried to clarify why Sanders was not violating the constitution–by saying someone’s religious beliefs can disqualify them from office–but in the process he made the problem crystal clear. “I’m a Christian, but part of being a Christian, in my view, is recognizing that there are lots of ways that people can pursue their God,” Van Hollen said. Now if Hollen means that Christians are tolerant of other religions and does not interfere with their practice for lots of reasons then great. Cause Vought seems to agree. But Sanders was having nothing of it. (And I don’t think that’s what Hollen meant) If you claim your religion is the only religion by which people can escape condemnation from God, then you are guilty of discrimination and disrespect. Period. Here’s Sanders again. Notice the logical move here. Respect is about what you believe and what you espouse not by your actions. Vought has never engaged in disrespectful actions. His beliefs are disrespectful. The standard historic Christian beliefs espoused in the Bible are disrespectful, whether or not our actions are. I’ve sat across from Muslims over coffee for hours getting to know them. I have never knowingly treated a Muslim believer with anything but respect. Ostensibly neither has Vought or Sanders would have surely given examples. None of that matters in post-modern America. If your beliefs are disrespectful because they are not pluralistic, then you are guilty of disrespect. Full Stop. You are condemned for your beliefs. Never mind that orthodox Islam believes in exclusivity. Never mind that the job description of deputy director of the OMB leaves little room for Vought to carry on a crusade against Islam (or Mormonism or Buddhism–all condemned by the message of Jesus). In Sanders mind, if you believe something disrespectful you must be incapable of tolerating that view you disrespect. You cannot be good for society. Go away. Trump “is trying to divide this country up,” Sanders said. From their perspective, this is what the exchange was really about: the sense that bigotry and discrimination have become nastier and more commonplace in recent months, which poses a direct threat to the democratic institutions they’re tasked with defending. Not only do Muslim’s also have an exclusive view of Islam being the truth, Bernie also is claiming that only his view of all religions being equally right is exclusively true. Not only that but if you disagree with him you are hate-filed. Not sounding very tolerant to me Bernie. When did holding a different view from others become tantamount to hate instead of being part of the free exchange of thought, and an important part of what it means to be an American?